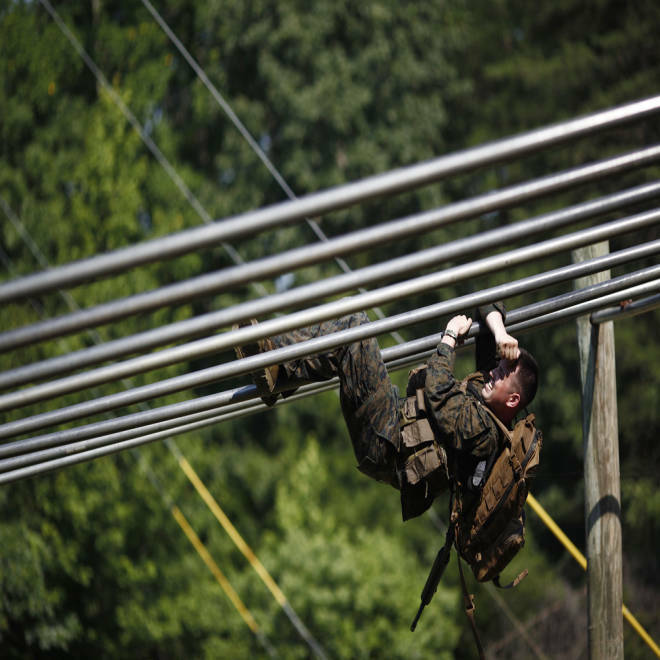 A Marine second lieutenant hangs on an obstacle course during the Marine Corps' Infantry Officer Course in Quantico, Va. on July 6. Beginning in September, women officer volunteers will participate in the course as part of a study to gauge the feasibility of allowing female Marines to serve in more extensive combat roles. Come September, a small group of young female Marines will break through one of the last bastions of macho in the U.S. military. They’ll be the first class of female officers to take part in the grueling Infantry Officer Course in Quantico, Va., a test of both physical fitness and mental will that prepares the corps’ future platoon leaders. But at least one female Marine officer, a former college hockey player and battle-tested engineering unit commander still on active duty, says placing women in infantry units is just a bad idea. Capt. Katie Petronio says women have no place in the Marine Corps infantry. “Infantry is one of those fields we need to leave alone.” Marine Capt. Katie Petronio told msnbc.com. Petronio was just back from Afghanistan last year — where she worked shoulder to shoulder with infantrymen — when she heard people arguing that it was a violation of rights to restrict women from combat. The rights advocates missed the point, she said. The article details her personal experiences during deployments to Iraq and Afghanistan, making the case that the physical rigors of infantry are not for women. The Pentagon has changed some of its rules. Women will be permitted in crucial and dangerous jobs closer to the front lines. NBC's Jim Miklaszewski reports. Even though she was a standout Bowdoin athlete and could bench press 145 pounds and squat 200 pounds, was ranked 4th out of a class of 52 in Officer Candidate School and excelled at Marine Corps fitness tests, Petronio's deployment in combat operations in Iraq and Afghanistan took a brutal toll on her 5-foot-3-inch body. In Iraq, she developed severe restless leg syndrome, and a spine injury pressed on her nerves. In Afghanistan she was the senior Marine in her engineering unit working 16-hour days for weeks at a time building patrol bases. Marine Corps Capt. Katie Petronio, right, poses with children at Patrol Base Mateen, Afghanistan. "By the fifth month into the deployment, I had muscle atrophy in my thighs that was causing me to constantly trip and my legs to buckle with the slightest grade change,” she wrote. “My agility during firefights and mobility on and off vehicles and perimeter walls was seriously hindering my response time and overall capability. It was evident that stress and muscular deterioration was affecting everyone regardless of gender; however, the rate of my deterioration was noticeably faster than that of male Marines and further compounded by gender-specific medical conditions.” She lost 17 pounds on an already lean body. Her article has supporters and detractors, but Petronio said she’s just relating her own experience to avoid any sort of blanket policy that could end up putting lives in peril. The decades-long debate over changing roles of women in the military reached a turning point in 2011 when Congress directed the Pentagon to take a hard look at policies that restrict female service members. In February, the Defense Department relaxed some restrictions, moving women closer to combat, but a fuller review of combat jobs is under way. It turns out that though women have fought and died in every American war, and many female troops performed with valor under fire in Iraq and Afghanistan, there is a lack of data to back any service-wide decision on which close-to-combat jobs would ultimately be open to them. Even now, about 44 women across the Marine Corps are serving in jobs normally closed to women as part of the research program, Haney said. The Iowa National Guard undergoes "Female Engagement Team" training prior to deploment to Afghanistan. Soldiers prepare themselves for cultural encounters with Afghan men and women played by actors in this video. But whether women will join the ranks of grunts in the future is unclear. 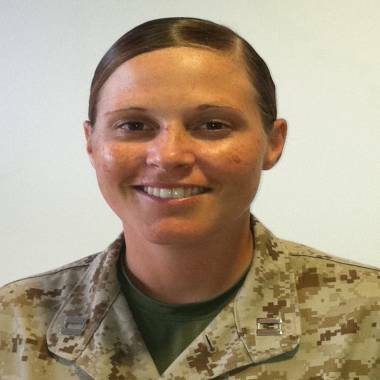 As one female Marine told msnbc.com, "No one questions why there aren't any females in the NFL, NBA, MLB, NHL, etc. Olympic athletes are the elite of the elite. No one questions why the women compete against women and men against men. Those are great sports and achievements. But lives and missions aren't on the line. In our world, if you move slower one day, you don't get bumped off the medal stand, you could die or get someone else killed."